I’ve been looking for quilty love in all the right places, I’ll tell you that. 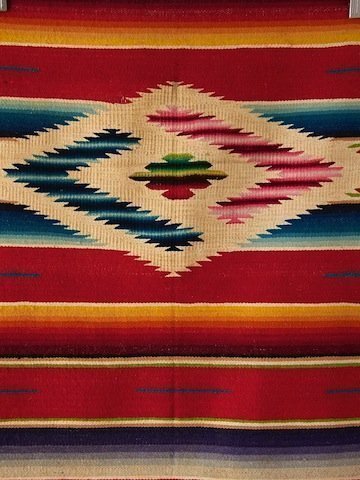 I need to create a background foundation for the January Obsession quilt before I go any farther with the appliqued flowers, and I have been looking to the imagery of the Mexican and South American serape blankets for a starting point. 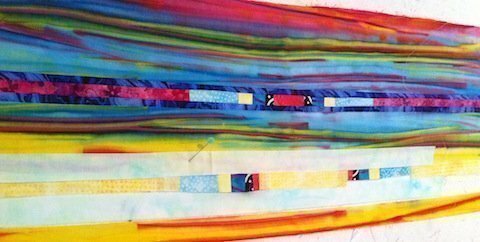 With the linear nature of these textiles and the gradating stripes, the little chunks of colors in some, and the white triangles in others, I’m on track for a colorful background for the quilt. 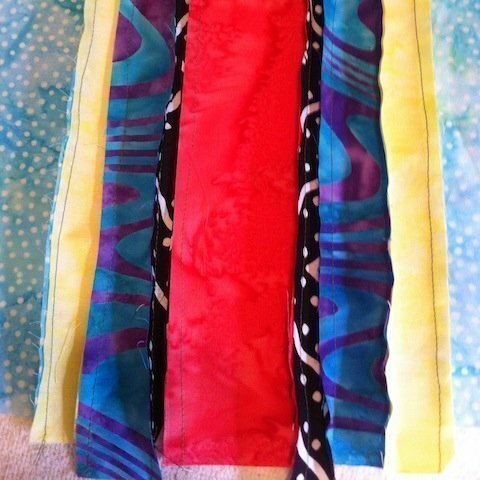 I spy black stripes, graduating monochromatic sections and bold, clear colors. 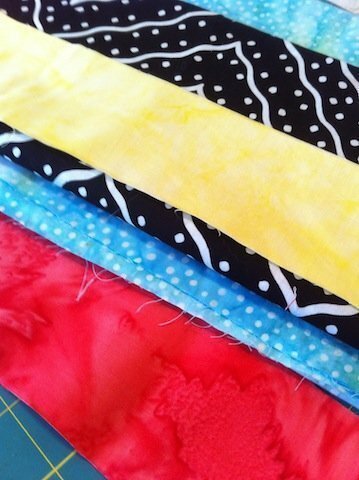 Be sure to see more of the beautiful serapes I’ve added to the Obsession Pintrest page. 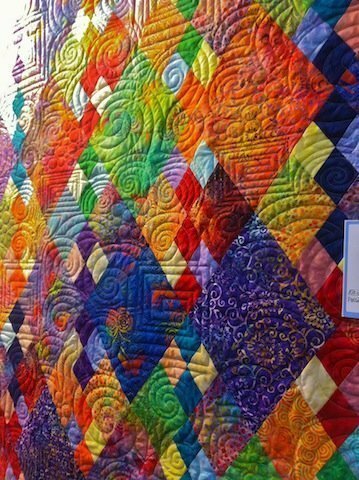 My next stop for inspiration was the big quilt expo, called Road to California, which was held last weekend in Ontario, California. 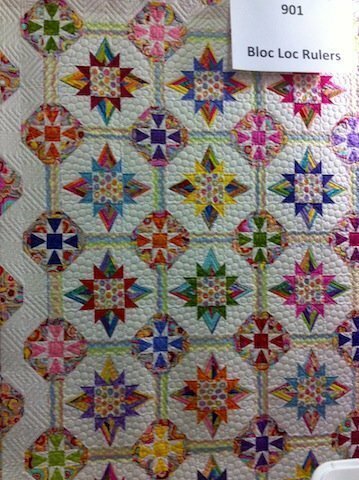 Great colors and great quilting! 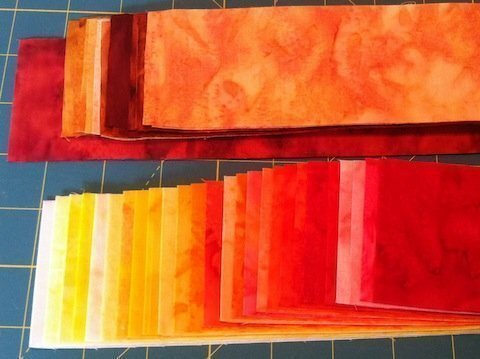 I found a few quilts whose colors spoke to me! 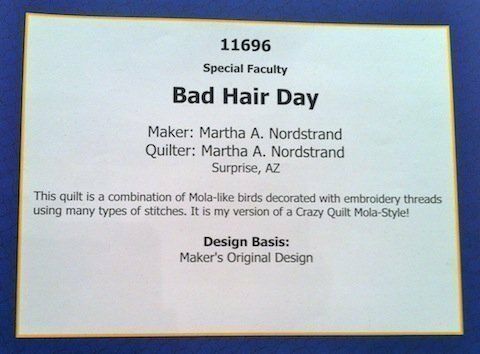 Martha A. Nordstrand’s Bad hair day was really delightful to see with its great appliques and embroidery. 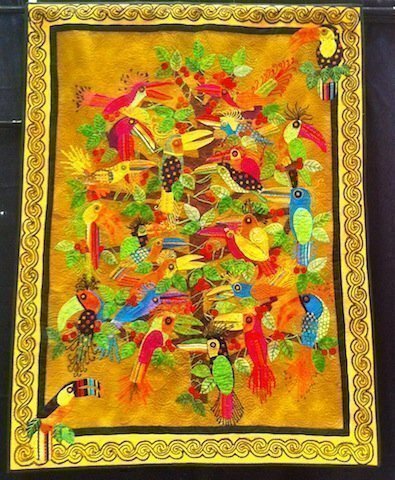 It had dimensional flowers and a tree and birds – just like my quilt will! 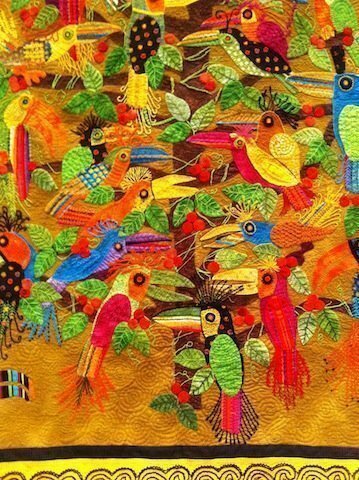 I love the jubilant nature of the design and the playful motifs. 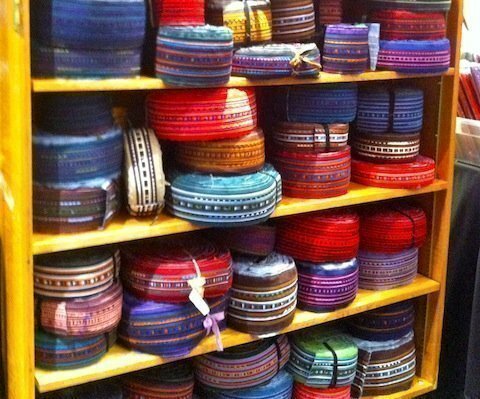 These large spools of “appliqued ribbons” were from Vietnam, and they reminded me of the applique work I have seen from the Hmong people. So, all this brings me to my quilt. 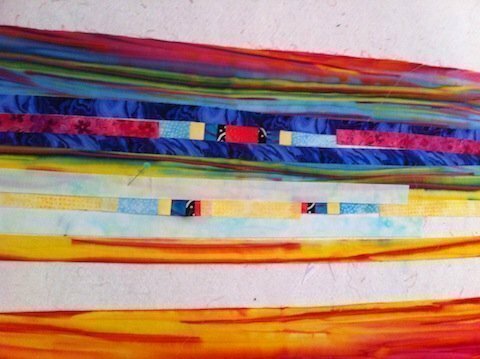 My original idea for the background was to sew these pre-cut strips up into a gradating field. When I opened up the package, I removed the strips that had brown or more dull tones. This will help keep the background more in the clear-colors that appear in the serapes that I liked the most. 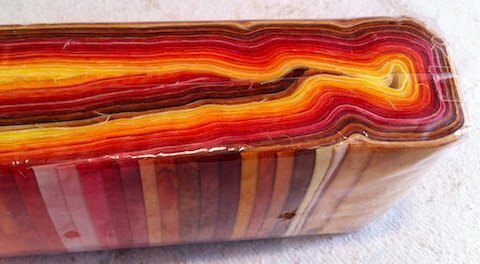 Next, I rifled through my batik boxes (, and when I say ‘rifled through’ I do mean made a big mess,) and picked out some candidates to go with the pre-cut 2 1/2″ strips. 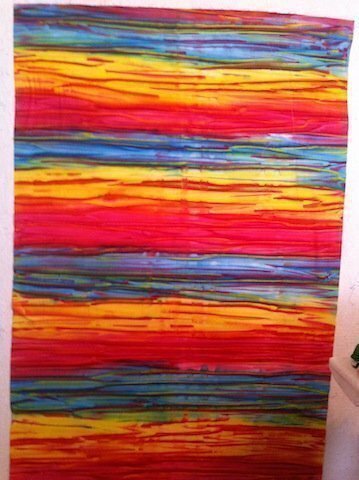 And that’s when I found this little 1 1/2 yard beauty! Mmm Humm. 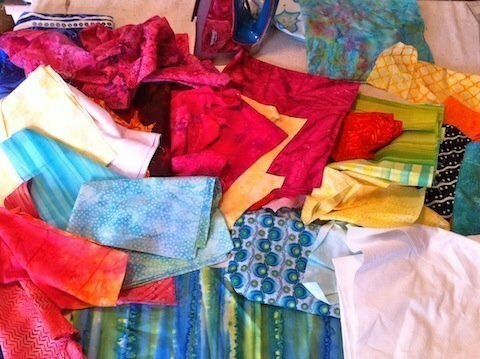 It’s a crazy bit of batik I picked up at the I-can’t-be-expected-to-remember-exactly-where-I-purchased-each-and-every-fabric-I-have-in-my-stash store. So I decided to use this piece as a foundation. It’s not as clean nor as linear as the serapes, but I think I can work with it to make an exuberant wall for my quilted flowers. There’s something screwy with this sewing! 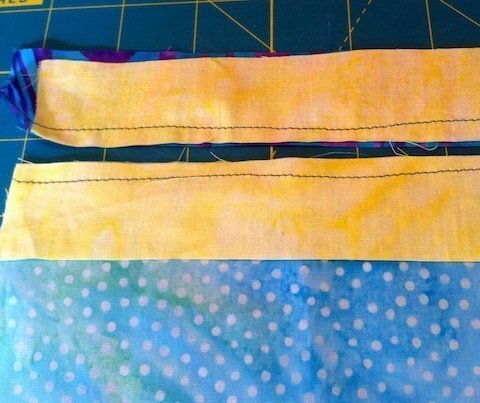 As I sewed the pieces together, I drove in and out to vary the stitch width and make the seams wonky. 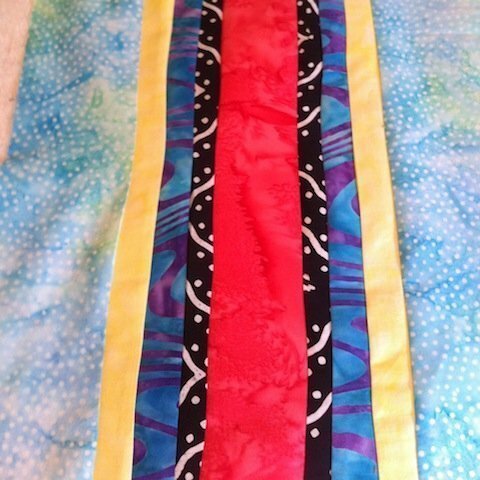 It’s a bit silly to sew all funky on these pieces because I’m going to sub-cut them so small that none of the wonk will even show. But it makes me happy – and I feel free and a bit naughty when I’m doing it – and that, my friends, is priceless! So, I’m going to subcut my strip sets up and insert them into the background with pairs of another color above and below. I only had an hour to work today, so this is as far as I got. I picked up a little parting gift on my trip to L.A…. 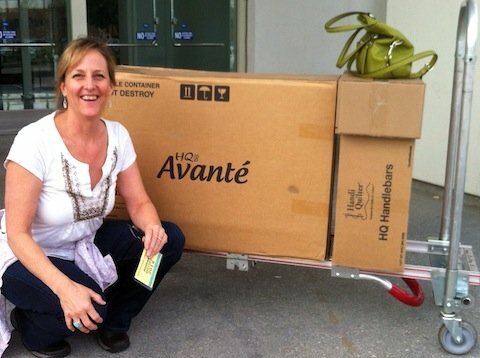 Alethea Ballard goes HQ 18! Thank you for sharing your creative process! Can’t wait to see more and of course the finished project! I am glad that you are enjoying it. I alternate between thinking this is great and this is going to crash and burn. Here’s hoping! Thank you for staying in touch – I hope you are not too cold out there!